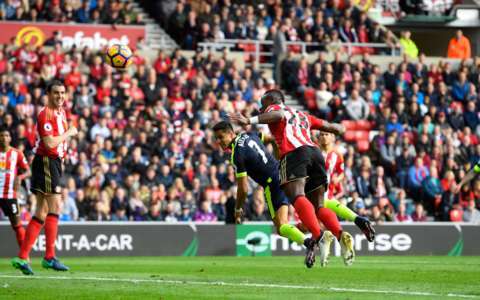 A stunning seven-minute spell of football saw Arsenal dispatch Sunderland 4-1 at the Stadium of Light. The Gunners had looked lazy in the second period having gone ahead through Alexis Sanchez’s first-half strike, allowing their hosts to equalise from the penalty spot. 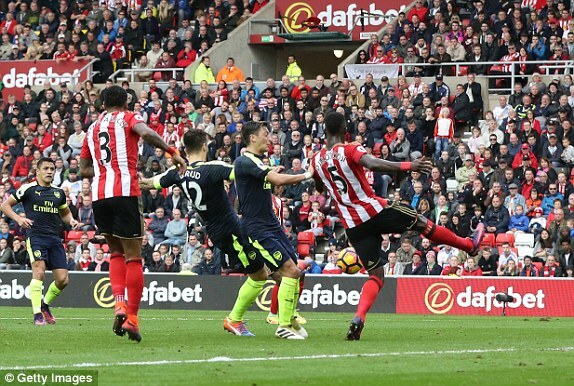 It turned out Jermain Defoe’s spot-kick was exactly what Arsene Wenger’s men needed to spark them into life, with substitute Olivier Giroud grabbing a brace and Sanchez notching another to put the match to bed, leaving Sunderland fans – and David Moyes – looking devastated, as relegation now looks a real possibility. Under pressure from the off, the Black Cats barely made a foray forward, as Alex Oxlade-Chamberlain, Mesut Ozil and Sanchez all troubled Jordan Pickford with strikes. And it was the latter who eventually broke the deadlock with 19 minutes on the clock, beating Lamine Kone in the air with a smartly-timed run, nodding the ball past the Sunderland goalkeeper from Oxlade-Chamberlain’s cross, while the superb passing play prior to the assist was also a striking sight in full flow. Moyes’ struggling side nearly gave the perfect retort, as a Patrick van Aanholt free-kick had Petr Cech scrambling to cover his goal, but it was soon the Gunners on the front foot again with Sanchez a constant and impish presence. Sunderland didn’t look toothless in a pacey first-half, with Defoe a lurking menace as Duncan Watmore and Wahbi Khazri attempted to feed the ball through to the instinctive striker, but they lacked real quality elsewhere across the pitch and seem set for a long struggle against relegation. A stunning lobbed ball to Ozil should have resulted in a second for Arsenal but, with Pickford off his line, the German failed to lift his shot above the young Englishman. To make Moyes’ afternoon worse, John O’Shea was forced off through injury, while Khazri, Didier Ndong, and Steven Pienaar were all cautioned as they attempted to stop their opponents’ drives forward. 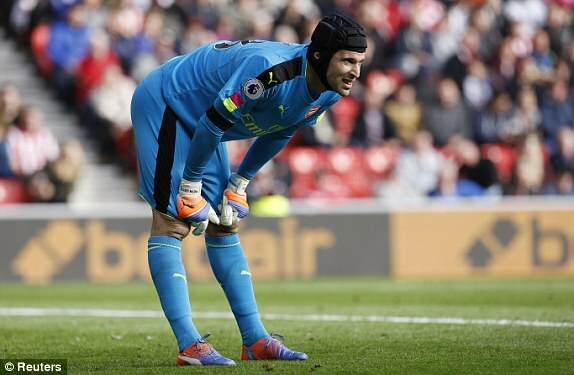 As the second period wore on, Arsenal appeared to lose focus allowing Ndong, Watmore and Defoe chances, although none of them truly troubled Petr Cech. Sanchez was furious on the hour-mark, as Martin Atkinson waved play on when he went down under a challenge inside the penalty area. And the Gunners were left ruing the drop in their performance moments later as Cech felled a scampering Watmore in the box, allowing Defoe to slam home an equaliser from the spot. 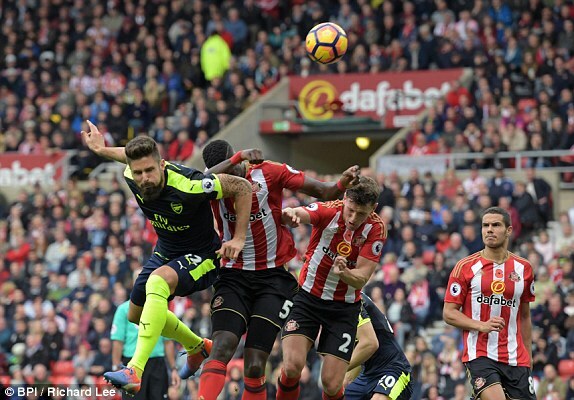 Scoring, though, was the worst thing Sunderland could have done, raising the Gunners from their slumber, and it was forgotten man Giroud who did the damage. First, just two minutes after replacing Alex Iwobi, he hooked an Oxlade-Chamberlain cross beyond the reach of Pickford, before a flick header from an Ozil corner made the score 3-1. 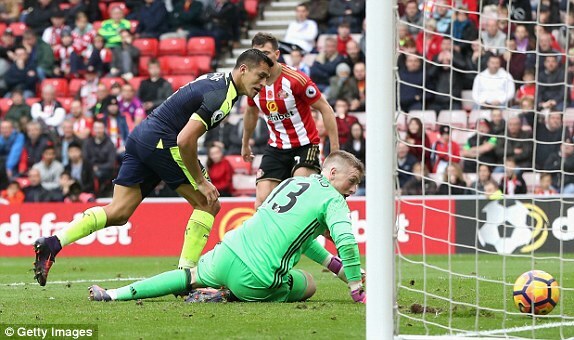 Then, to round off a stunning seven minute spell, Sanchez was able to clip a shot home from inside the six-yard box after Sunderland failed to clear their lines. Supporters at the Stadium of Light looked stunned by the scoring spree, while Moyes sat motionless on the touchline. He will know his team face a real battle to avoid dropping into the Championship. Wenger meanwhile, will be delighted his side were able to respond with such gusto to an equaliser which threatened to derail their hopes of victory, especially ahead of a Champions League clash with Ludogorets on Tuesday.